Devanāgarī (देवनागरी, IPA: [ˈdeɪvəˌnɑgəri]) is an abugida script used to write several Indian languages, including Sanskrit, Hindi, Marathi, Sindhi, Bihari, Bhili, Marwari, Konkani, Bhojpuri, Pahari (Garhwali and Kumaoni), Santhali Language; languages from Nepal like Nepali, Nepal Bhasa, Tharu and sometimes Kashmiri and Romani. It is written and read from left to right. The transliteration used in this article follows the scholarly IAST and popular ITRANS conventions. Devanāgarī emerged around 1200 C.E. out of the Siddham script, gradually replacing the earlier, closely related Sharada script (which remained in parallel use in Kashmir). Both are immediate descendants of the Gupta script, ultimately deriving from the Brāhmī script attested from the third century B.C.E. ; Nāgarī appeared around the eighth century as an eastern variant of the Gupta script, contemporary to Sharada, its western variant. The descendants of Brahmi form the Brahmic family, including the alphabets employed for many other South and South-East Asian languages. Sanskrit nāgarī is the feminine of nāgara "urban(e)," an adjectival vrddhi derivative from nagara "city"; the feminine form is used because of its original application to qualify the feminine noun lipi "script" ("urban(e) script," i.e. the script of the cultured). There were several varieties in use, one of which was distinguished by affixing deva "deity" to form a tatpurusha compound meaning the "urban(e) [script] of the deities (= gods)," i.e. "divine urban(e) [script]." However, the widespread use of "Devanāgarī" is a relatively recent phenomenon; well into the twentieth century, and even today, simply Nāgarī was also in use for this same script. The rapid spread of the usage of Devanāgarī seems also to be connected with the almost exclusive use of this script in colonial times to publish works in Sanskrit, even though traditionally nearly all indigenous scripts have actually been employed for this language. 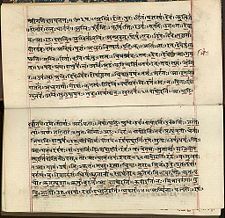 This has led to the establishment of such a close connection between the script and Sanskrit that it is, erroneously, widely regarded as "the Sanskrit script" today. The Devanāgarī writing system can be called an abugida, as each consonant has an inherent vowel (a), that can be changed with the different vowel signs. Devanāgarī is written from left to right. A top line linking characters is thought to represent the line of the page with characters historically being written under the line. In Sanskrit, words were originally written together without spaces, so that the top line was unbroken, although there were some exceptions to this rule. The break of the top line primarily marks breath groups. In modern languages, word breaks are used. Devanāgarī has 12 svara (pure sounds, or vowels) and 34 vyañjana (ornamented sounds, consonants). An akṣara is formed by the combination of one (or none) vyañjana and one or more svara, and represents a phonetic unit of the shabda (utterance). The akṣara is written by applying standard diacritical modifiers to the vyañjana corresponding to the svara. An akṣara is usually more basic and predictable than the syllable in English. For example, the English 'cat' (considered to have just one syllable in English) is written as two akṣaras, the 'ka' and the 'ta'. The svara and vyañjana are ordered and grouped logically for studying or reciting. Thus the pure sounds, 'a', 'i', 'u' and their lengthened versions ('ā', 'ī', 'ū') are followed by the combined ('e', 'ai', 'o', 'au'), nasal ('ṃ') and aspirated ('ḥ') forms. The vyañjana themselves are grouped into six groups (rows) of five (columns). The first five rows progress as velar, palatal, retroflex, dental and labial, corresponding to utilizing or touching the tongue to progressively outer parts of the mouth when making the sound. Additional vyañjana are technically sonorants, sibilants, or widely used conjunct forms. For each row or group, the columns logically progress to softer sounds, paired with aspirated forms, ending in the nasal form for that group. Most consonants can be joined to one or two other consonants so that the inherent vowel is suppressed. The resulting conjunct form is called a ligature. Many ligatures appear simply as two individual consonants joined together, and so are a form of ligature. Some ligatures are more elaborately formed and not as easily recognized as containing the individual consonants. When reading Sanskrit written in Devanāgarī, the pronunciation is completely unambiguous. 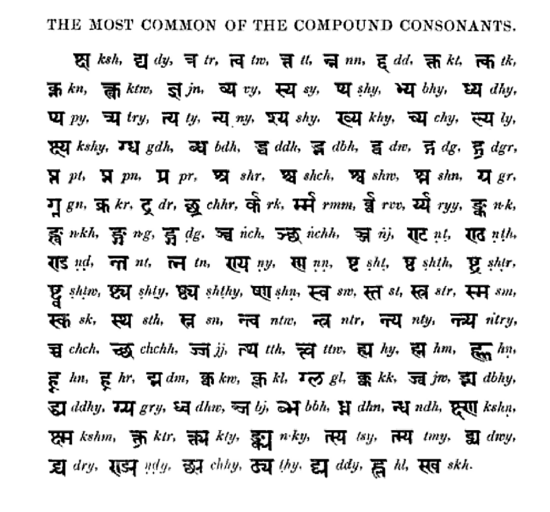 Similarly, any word in Sanskrit is considered to be written only in one manner (discounting modern typesetting variations in depicting conjunct forms). However, for modern languages, certain conventions have been made (e.g. truncating the vowel form of the last consonant while speaking, even as it continues to be written in full form). There are also some modern conventions for writing English words in Devanāgarī. Certain Sanskrit texts and mantras are typically written with additional diacritical marks above and below the akṣara to denote pitch and tempo, to ensure completely accurate reproduction of the sound. Note: This page or section contains IPA phonetic symbols in Unicode. See International Phonetic Alphabet for a pronunciation key. All the vowels in Devanāgarī are attached to the top or bottom of the consonant or to an <aa> vowel sign attached to the right of the consonant, with the exception of the <i> vowel sign, which is attached on the left. In the Devanāgarī vowel table below, the "Letter" column contains the symbol used when a vowel occurs without a consonant, the "Vowel sign with <p>" column contains the symbol used when a vowel is attached to a consonant, shown with the <p> letter as an example, the "Unicode name" column contains the name given in the Unicode specification for the vowel, and the "IPA" column contains the International Phonetic Alphabet character(s) corresponding to pronunciations of the Devanāgarī character. Displayed are the pronunciations of each character in Sanskrit and three representative New Indo-Aryan languages: Western Hindi, Bhojpuri, and Marathi. The short open-mid front unrounded vowel (/ɛ/: as e in get), does not have any symbol or diacritic in some usages of Devanāgarī script. In several Hindi dialects, the vowel is expressed as an allophonic variant of schwa when it occurs before sounds like ha; eg., रहना is pronounced as /rɛhnä:/ instead of as /rəhənä:/. 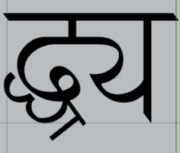 The short open-mid back rounded vowel (/ɔ/) is not traditionally represented in Devanāgarī, but a new symbol has been invented for it in order to account for the pronunciation of English loanwords: ऑ, eg. पॉ. The table below shows the traditional Sanskrit matrix of the core consonantal characters, along with IAST and IPA. While this sound set has remained the same for the most part, changes or alternate pronunciations are included in fields where applicable, with the Sanskrit pronunciations on top. All consonant characters are inherently followed by the neutral vowel schwa. At the end of the traditional table of alphabets, two clustered characters are also added, which are shown in the table below. Also shown above them is another character, used in Vedic Sanskrit, Marathi, and Rajasthani. No new shapes were formulated beyond that of the Sanskritic set. Internal developments and foreign borrowings (i.e. Persian) were dealt with by the use of diacritics on existing characters, the most prolific diacritic being the underlying nukta or bindu ("dot"). The accommodation was that of a dot beneath the letter representing the nearest approximate sound. These are not included in the traditional listing. Note that both ऋ and ड़ use ṛ in IAST. The implosives of Sindhi are accommodated with underlining. Consonant clusters of two or more phonemes are realized by combining the aksharas into ligatures. Typically, the preceding akshara loses its vertical stroke and is put in direct contact with the succeeding one. In cases of aksharas that do not have vertical strokes in their independent form, the following aksharas are usually placed underneath the preceding one. In some cases, the ligatures take forms not readily recognizable as composed of the individual aksharas (e.g. <jñ>). Consonant clusters involving <r> are treated as a special case: preceding <r-> is realized as a right-facing hook above the following akshara, and following <-r> appears as a slanted stroke attached to the vertical stroke of the preceding akshara. Similarly for a cluster /XYZa/, both X and Y would be "halved." There are many variants for this consonant cluster writing in Devanāgarī script. The most common system is shown below for the traditional table. Here the second vowel is taken to be n, followed by a /ə/. You will only be able to see the ligatures if your system has a Unicode font installed that includes the required ligature glyphs (e.g. one of the TDIL fonts, see "external links" below). अं (called anusvāra), pronounced as /ⁿ/ (IAST: ṃ) is used for nasalizing the vowel in the syllable, the word-final allophone of /m/ and /n/. The diacritic ँ (called chandrabindu/anunāsika) is used in certain shakhas instead of the anusvāra in certain phonetic contexts. अः (called visarga), pronounced as /əh/ (IAST: ḥ) is the word-final allophone of /s/ and /r/. If a lonely consonant needs to be written without any following vowel, it is given a halanta/virāma diacritic below (प्). avagraha ऽ is used in western editions to mark elision of a word-initial /a/ in sandhi. The pitch accent of Vedic Sanskrit is written with various symbols depending on shakha. In the Rigveda, anudatta is written with a bar below the line (॒), svarita with a stroke above the line (॑) while udatta is unmarked. There are several methods of transliteration from Devanāgarī into Roman scripts. The most widely used transliteration method is IAST. However, there are other transliteration options. A standard transliteration convention was codified in the ISO 15919 standard of 2001. It uses diacritics to map the much larger set of Brahmic graphemes to the Latin script. See also Transliteration of Indic scripts: how to use ISO 15919. The Devanagari-specific portion is nearly identical to the academic standard for Sanskrit, IAST. The International Alphabet of Sanskrit Transliteration (IAST) is the academic standard for the romanization of Sanskrit. IAST is the de-facto standard used in printed publications, like books and magazines, and with the wider availability of Unicode fonts, it is also increasingly used for electronic texts. It is based on a standard established by the Congress of Orientalists at Athens in 1912. The National Library at Kolkata romanization, intended for the romanization of all Indic scripts, is an extension of IAST. Compared to IAST, Harvard-Kyoto looks much simpler. It does not contain all the diacritic marks that IAST contains. This makes typing in Harvard-Kyoto much easier than IAST. Harvard-Kyoto uses capital letters that can be difficult to read in the middle of words. ITRANS is a lossless transliteration scheme of Devanāgarī into ASCII that is widely used on Usenet. It is an extension of the Harvard-Kyoto scheme. In ITRANS, the word Devanāgarī is written as "devanaagarii." ITRANS is associated with an application of the same name that enables typesetting in Indic scripts. The user inputs in Roman letters and the ITRANS pre-processor displays the Roman letters into Devanāgarī (or other Indic languages). ALA-LC romanization is a transliteration scheme approved by the Library of Congress and the American Library Association, and widely used in North American libraries. Transliteration tables are based on languages, so there is a table for Hindi, one for Sanskrit and Prakrit, etc. ISCII is a fixed-length 8-bit encoding. The lower 128 codepoints are plain ASCII, the upper 128 codepoints are ISCII-specific. It has been designed for representing not only Devanāgarī, but also various other Indic scripts as well as a Latin-based script with diacritic marks used for transliteration of the Indic scripts. ISCII has largely been superseded by Unicode, which has however attempted to preserve the ISCII layout for its Indic language blocks. The Unicode range for Devanāgarī is U+0900 ... U+097F. Grey blocks indicate characters that are undefined. The Mac OS X operating system supports convenient editing for the Devanāgarī script by insertion of appropriate Unicode characters with two different keyboard layouts available for use. To input Devanāgarī text, one goes to System Preferences → International → Input Menu and enables the keyboard layout that is to be used. One then views the keyboard layout at the Indian Language Kit Manual at Apple Docs. HindiWriter - The Phonetic Hindi Writer with AutoWord lookup and Spellcheck for MS Word and OpenOffice.org for Windows. ↑ Colin Masica, Indo-Aryan Languages (Cambridge University Press, 1991), 110-111. ↑ Shaligram Shukla, "Bhojpuri," in Jane Garry and Carl Rubino, An encyclopedia of the world's major languages, past and present (New England Publishing Associates, 2001), 87. ↑ Franklin C. Southworth, "Marathi," in Jane Garry and Carl Rubino, An encyclopedia of the world's major languages, past and present (New England Publishing Associates, 2001), 472. Wikner, Charles. A Practical Sanskrit Introductory. 1996. (Online version) Retrieved August 10, 2008. All links retrieved October 25, 2017. This page was last modified on 25 October 2017, at 14:47.